Filaments of ionized gas in the proximity of the R136 cluster, which lies beyond the lower left edge of the photo. Filaments of ionized gas in the proximity of the R136 cluster, which lies beyond the lower left edge of the photo are revealed in this beautiful space wallpaper. The different hues are due to different physical conditions that manifest themselves in the spectrum of the light emitted by the gas. 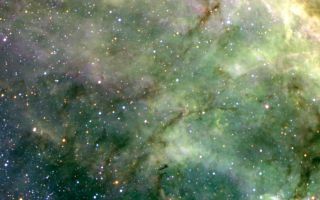 Note also the dark lanes running roughly from bottom left to upper right, which are due to filaments of obscuring dust seen in projection against the background of bright nebulosity. The sky field measures 6.5 x 5.7 arcmin. North is up and East is left.